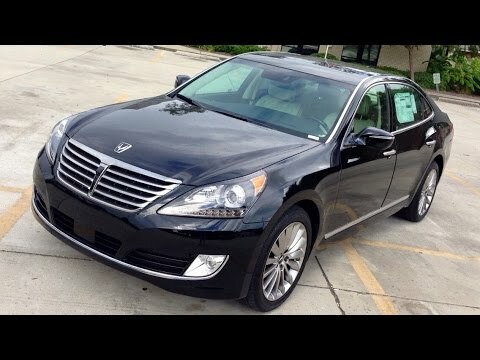 The 2015 Hyundai Equus is proof that extreme luxury and value-consciousness can go hand in hand. Like executive sedans such as the Lexus LS, Audi A8 and BMW 7 Series, Hyundai's full-size cruiser brims with power, amenities and sophistication but costs thousands less. Yet for all its features, the Equus lacks the intangible allure of a luxury brand's badge. The cup holder area in the console is very awkward for two people trying to dodge each other and the cups in the holes. Very poor design. I had an SUV previously and miss the capacity to haul more items such as mulch, sod,etc. Also liked the better vision surrounding me from being higher in the driver's seat. I miss the comfort of the console on long trips for ease in the cup holders and room for the dog. This will probably be my last car and it does ride very comfortably. Hyundai's luxury sedan. . Most comfortable ride. Luxury car with a very comfortable ride. Handles well in all types of weather. Excellent gas mileage. Features that stand out are. . . Heated a bed for conditioned seats in the front and rear seats, privacy curtain, armrest controls in rear, with power seats and windows.